Upper Rogue scenery. The crispy cool morning warmed to a 79 °F high. I ventured up to the upper Rogue to flyfish for winter steelhead yesterday. The water flow had bumped up about 100 CFS so any last flush of winter fish would be motivated to move into the far upper reaches of the river. 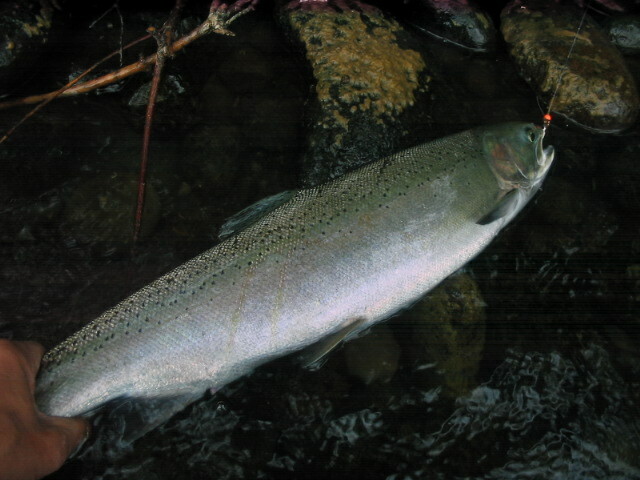 There was also the chance for Spring chinook as the word is that they are already reaching the hatchery at Cole Rivers. The river was up and wading the slippery rocks was very much harder than it had been of late. The warming sun took the chill off the morning air very quickly. The first of the salmonflies made their appearance, fluttering across the river to land on the trees at my back. 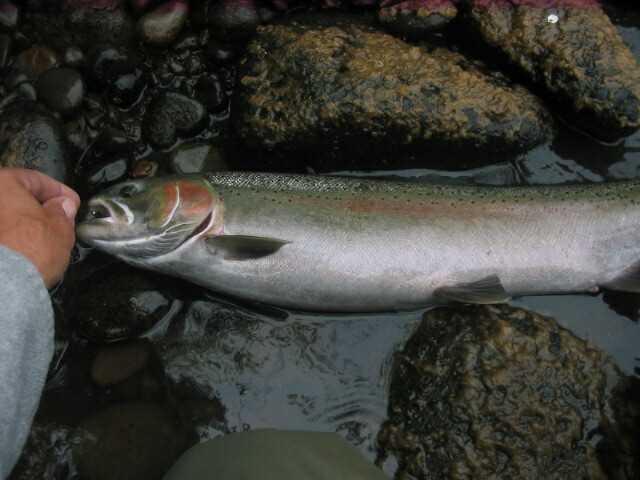 I plucked one from the bank and threw it out upon the water to watch a big trout whack it after floating half a minute. Steelheading was slow. My favorite water was lacking of the “bite” of the big pullers. Later in the morning I finally found a nice buck who bite on the original Carpetbagger Nymph. That’s the stonefly nymph imitation made with the Midnight Fire color of New Age Chenille. He fought really good and I was satisified with my catch, but I got the feeling that this might be the last of the winter steelhead catching for this year. 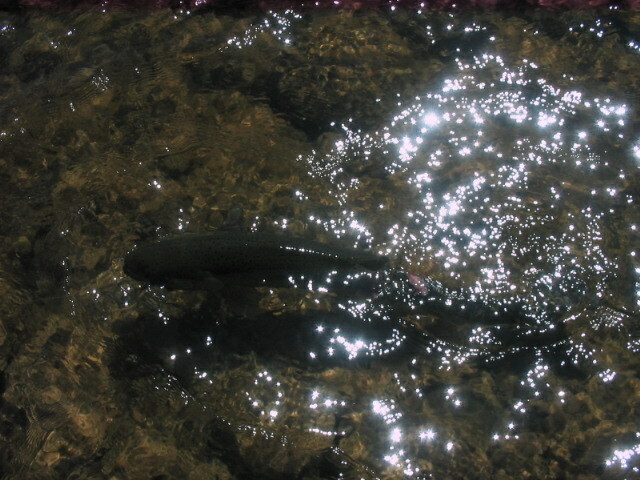 Later I saw more fish, but they were in the spawning runs. Up near the hatchery I watched the guys fish the “infamous hatchery hole.” I was soon rewarded with the sight of a big net being employed. The “boys” along the concrete and rock bank pulled a large and thrashing chinook from the deep water. 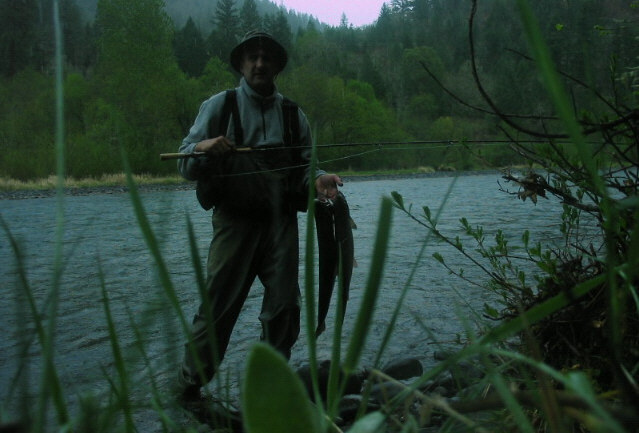 Yes indeed, the upper Rogue is making that fishing transition from winter steelhead to Spring chinook, and just as the Rogue Valley air temperatures trend from mild and unseasonably cool to climbing and getting near warm with the approach of June. Scrappy winter buck just before the release in wadeable water. 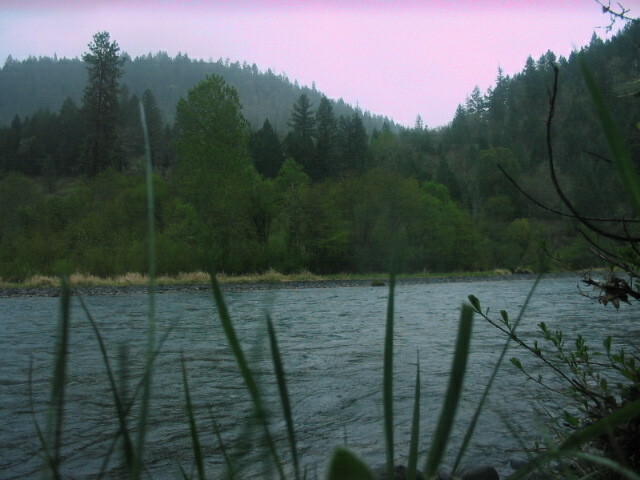 Mother’s Day, flyfished the upper Rogue River with Teri. The day began mild and with sun. We drove up towards Shady Cove noticing large grey clouds dominating the sky beyond our destination. 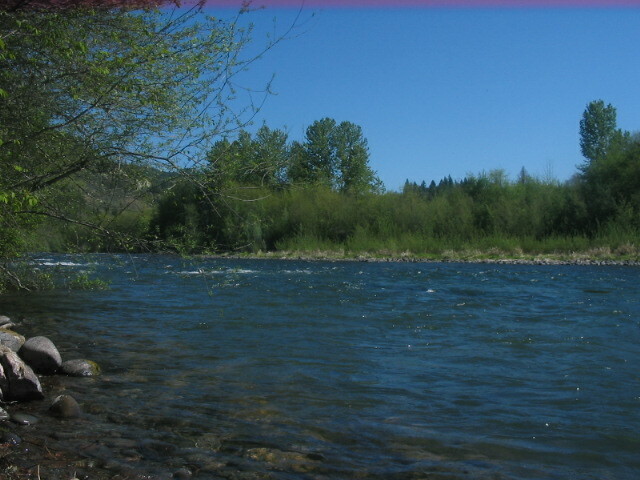 We parked our vehicle admidst a number of Mother’s Day picnics and gatherings, suited up in waders and light wear, and hiked to the river. The water was cool and slippery with mossy rocks. G.R. Hare’s Ears and Carpetbagger Nymphs were thrown and a number of trout were biting. With the number of steelhead into the upper Rogue over 10,000, every cast offered the chance of that “big pull.” The wind came up a bit, and soon the sky darkened and let loose on us. We found a bit of shelter, from rain, hail, thunder and lightening, huddling together tight to a high bank of the river under a roof of willows, brush and Douglas Fir. Soaked and cold we eventually made a hurried dash back to the parking area which was now devoid of any cars but ours. Earlier in the week my attention was once again turned towards the morel mushroom of the Rogue Valley. 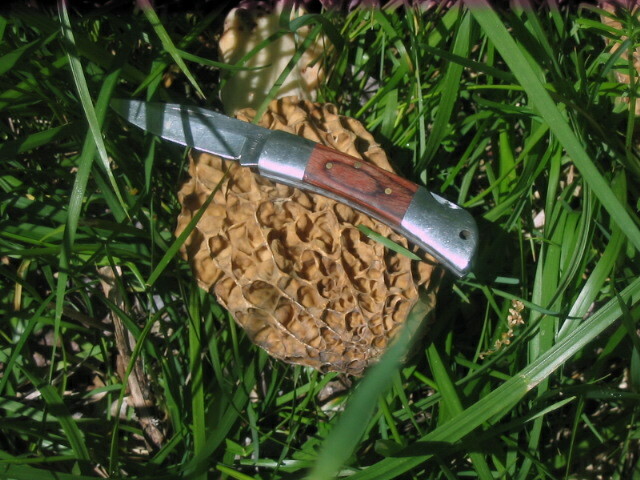 On the 21 of April I stumbled upon this beautiful morel and several others along a trail on private land. On April 21 I spotted this beautiful morel with several other along a trail meandering through Oregon Ash trees. A Cinco de Mayo return to the location found a full flush of perfect yellow morels along the route. My timing could not have been better as the following photos of the yellow fungi clearly show! 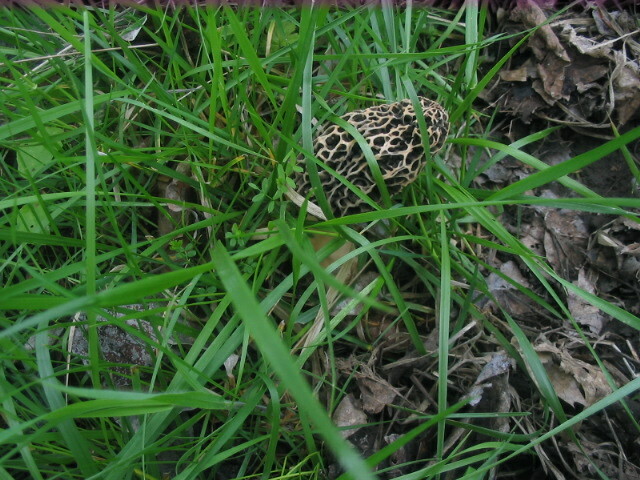 This morel could not hide. Off in the distance I spotted the tell-tale yellow rising from the green grass. 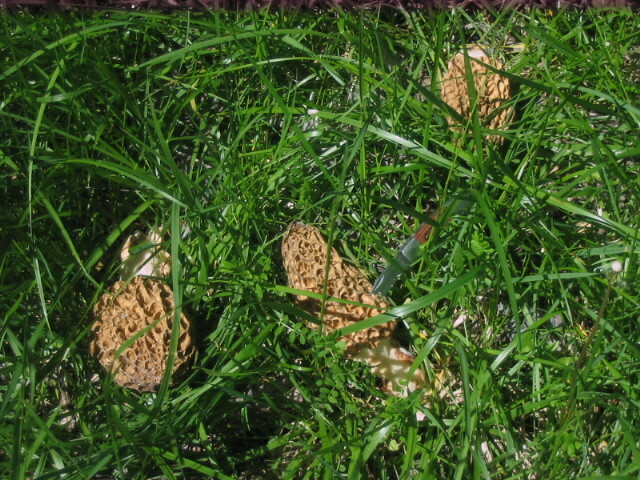 The morels were hiding in the tall grass of later Spring. 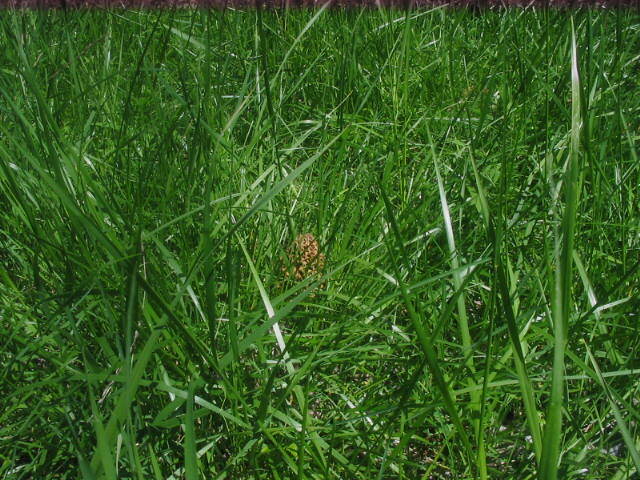 When combined with mature grass like this, one has to be very careful not to step on the often hidden fungi. Morel mushrooms this size are excellent stuffed with meats or veggies. 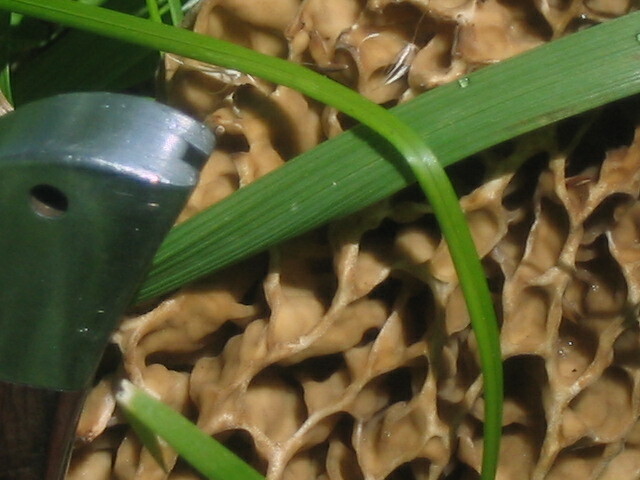 A bugs eye view of the delicious yellow morel wild mushroom. A stretch of river appears. My anticipation waxes. What will this day bring? This nice fat first fish couldn't resist a Beadhead G.R. Hare's Ear nymph. This hot fish went for the larger fly. She took a Brownbagger with hot orange beadhead. 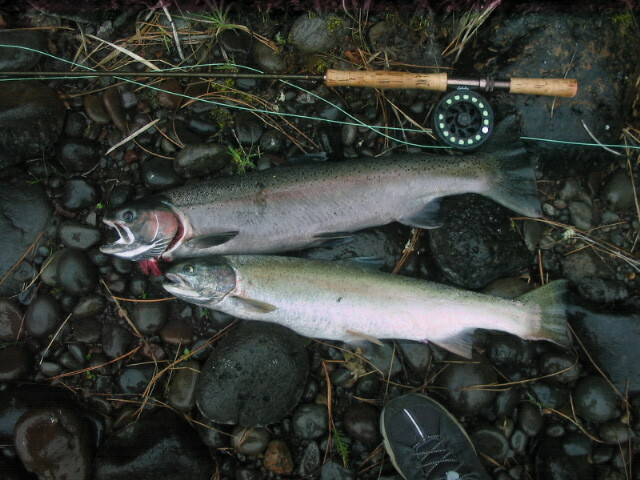 A fine May 3rd catch of hatchery winter steelhead from the Rogue River. Done guiding myself for the day! I think I'll give myself a good tip!